CANVAS: PENELOPE is the classic canvas which is used in Traditional Needlepoint. It is a double woven fabric with pairs of horizontal and vertical threads which form the mesh. When doing regular needlepoint, the stitches are worked diagonally over two horizontal and two vertical threads. For Petit Point, the double vertical thread is separated and all the meshes are worked. In Traditional Needlepoint the canvas measures 10 meshes to the inch or 20 Petit Point meshes. It is usually Antique Tan in color, but is also available in White and Off-White. MONOPOINT is a single weave canvas in which every mesh is of equal size. It is not as firm as Penelope and generally is not recommended for furniture pieces or any item that will receive hard wear. Monopoint canvas is usually White and, therefore, is suitable for hand painting. It is made in sizes ranging from 10 to 16 meshes to the inch (and even finer for Petit-Point) but 12 to the inch is the popular choice. INTERLOCKING canvas (Iino weave) is a monopoint construction made of vertical and horizontal double strands which are woven together at the intersections. The strands are permanently set and cannot be separated as in Penelope. This construction gives more stability than a simple monopoint weave, though it sacrifices something in strength YARNS AND THREADS: TAPESTRY WOOL is the Traditional yarn for needlepoint. It is made of long fibered, tightly twisted wool, which because of its quality and construction resists fraying and wear while it is being worked. A single strand of tapestry yarn can be used on 10 mesh penelope or 12 mesh monopoint canvas, or it may be split in half for working Petit Point. Tapestry Yarn, It is permanently mothproofed. PERSIAN YARN is actually a Crewel Embroidery yarn but it is also used for needlepoint. It is constructed of 3 loosely twisted strands of 2-ply yarn and it is interchangeable with tapestry wool. It is very easily separated into 1 or 2 strands for use on finer mesh canvas. Needlepoint and Crewel Wool, are packaged in 10 or 40 yard skeins and are also available by the strand. COTTON THREAD is used in working needlepoint for various special effects. Six Strand Cotton in multiple strands can be worked on regular mesh for highlight areas or on Petit Point canvas as a background for evening bags and purse accessories. It has more gloss than wool, which makes it suitable for dressier items. METALLIC & RAYON THREADS may be used for highlighting small areas or for complete pieces such as Belts, Jewelry, etc. Spotlight in Silver or Gold and Rayon are recommended. ACCESSORY ITEMS: NEEDLES. The blunt tapestry needle is recommended for all needlepoint. 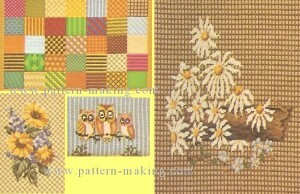 For standard Gross Point (10 and 12 mesh canvas) use size 18 or 19 needle; for Petit Point, size 21 or 22. NEEDLEPOINT FRAMES. Large panels of tapestry can be worked more conveniently on a needlepoint frame. Even for smaller pieces, the use of the frame keeps the canvas in shape so that it requires a minimum of blocking when it is completed. Most frames are of a rotating type and they come in many sizes to be used in the hand or on tables. 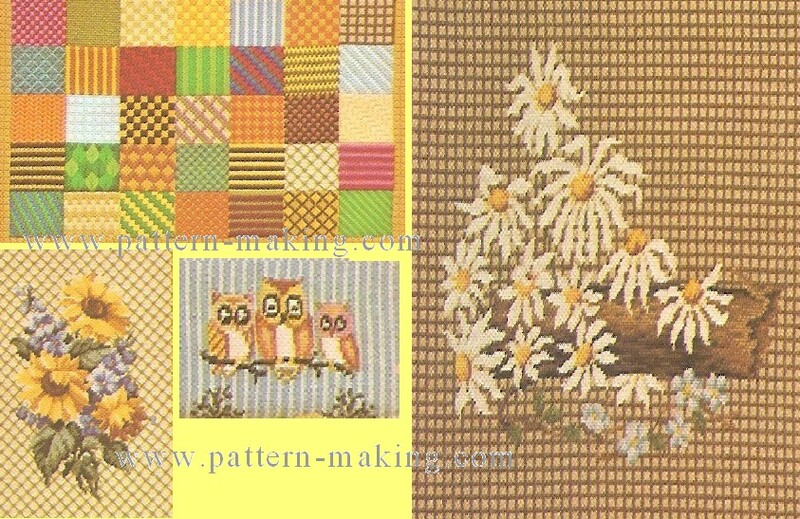 TYPES OF NEEDLEPOINT TRADITIONAL NEEDLEPOINT is usually done on 10 mesh to the inch Penelope canvas. The design is pre-worked and only the background needs to be filled in with the color and stitch of your choice to complete the piece. TINTED NEEDLEPOINT is like painting on canvas. It is screen printed rather than hand painted, though some are retouched by hand. The canvas may be white Monopoint or Antique Penelope. Sometimes these are packaged in kits with yarns and other materials needed to complete the item such as pillow backings. AMOUNTS OF YARN REQUIRED The amounts of yarn required may vary considerably depending on how many color changes there are within an area, the mesh count of the canvas and which stitch is being used. The following is given as a rule of thumb: HALF CROSS STITCH requires approximately 4/5 of a yard of tapestry or persian type yarn for 1 square inch of 10 mesh canvas. CONTINENTAL STITCH requires approximately 1-1/4 yards for 1 square inch of 10 mesh canvas. DIAGONAL TENT STITCH (basket weave) requires approximately the same yardage as the Continental Stitch. For other kinds of stitches or different meshes of canvas, it would be necessary to work a 1 inch square to see how much yarn is required. TO BEGIN WORKING Tape the edges of the canvas with masking tape. This prevents raveling and protects the yarn from catching in the raw edges’. Measure and mark the area to be worked. If it is to be a picture, select the frame and work only the part that will show. For a furniture piece, measure the Chair Seat or Foot Stool across the widest part, then plan to work one additional inch on all sides. Allow 2 inches of unworked canvas all around to facilitate blocking and finishing. Work with a strand of yarn not over 18″ in length. If a strand is too long, it becomes frayed and does not cover the canvas. To end a strand, run the needle under a previously worked row for about an inch and clip closely. If the yarn becomes too frayed to cover properly, fasten off and begin a new strand. For best results, work your piece in a needlepoint frame. If you prefer to work it in the hand, use the “Frame” or “Punch” method. This is done by bringing the needle straight up from the back to the front, then straight down from the front to the back in two stitches instead of sewing through in one stitch. This method prevents the yarn from wearing, makes stitches that are even, and keeps the canvas from pulling out of shape. Pull stitches taut but not tight. If the yarn becomes twisted while working, drop the needle and let it unwind. Although there are no set rules, it is usually recommended to work the design first then the background. Work the stitches in numerical or alphabetical order as given in each illustration. Bring yarn up at the odd numbers and down at the even numbers. If both numbers and letters are used, work numbers first, then letters. Where numbers or letters are upside down or sideways, turn canvas and diagram to correspond and continue work. Some stitches are photographed in several colors. These are shown to illustrate different effects which can be obtained by alternating colors. The same stitches may be worked in one color only for textural effects. When there is not room to work a complete stitch, work as much of the stitch as is necessary to cover the canvas. BLOCKING Blocking is necessary for most completed pieces because the diagonal direction of the needlepoint stitch pulls the canvas out of shape. Even when the use of a frame serves to keep the canvas in shape, blocking refreshes the yarn and brightens the colors. BLOCKING: Do not wet embroidered piece; it needs only to be somewhat dampened so that it can be stretched into shape. Wet a terry towel that is larger than embroidered piece and wring so that it is just damp (not dripping wet). Center piece flat on damp towel and roll up, being sure that towel keeps embroidered piece from touching itself and leave overnight. Remove slightly damp embroidery and stretch into shape by tacking or pinning to a board (wrong side of embroidery up) using rustproof pins or nails. Cover with a slightly damp cloth and let dry COMPLETELY before removing.